Anti-tack agents are materials required for eliminating self-adhesive property of rubber. These materials are applied to the surface of uncured rubber, which provides separation or release after storage during the rubber manufacturing process. Uncured rubber is defined as rubber that does not have superior adhesive properties as compared to other rubbers. Such rubbers possess a sticky characteristic, which is termed as tack. Long-chain polymer molecules are present in rubber in a helical structure, which unravel and form several similar structures when rubber is mixed with other elements. Hence, polymer molecules become entangled when similar uncured rubber surfaces come in contact, which results in cohesion between two rubber surfaces. Hence, helical structures respond to the tighter coil after some time based on stronger cohesion bond. When the temperature of rubber is increased and its viscosity is lowered, its tackiness increases. As a result, anti-tack agents are required to prevent rubber surfaces from sticking to each other. Anti-tack agents that were developed earlier consisted of high levels of different filler materials and were mixed with soap to coat the rubber. Companies manufacturing rubber began formulating their own anti-tack compounds, thus moving back in the value chain of the rubber industry. These companies produced anti-tacks based on their requirement. Raw material suppliers for the rubber industry also discovered the opportunity to produce anti-tack dips or coatings, which could be supplied to rubber manufacturers. Stearic acid is one of the major raw materials required in the production of stearates. It is commonly present in vegetable and animal oils and fats. However, it is abundant in animal fats as compared to vegetable oils. Vegetable oils and fats include palm oil, cocoa butter, shea butter, and soy oil. Rising prices of fats and oils are resulting in price hike of stearates. There is lack of consumer awareness regarding stearates such as magnesium stearates across all regions. Various research articles state that magnesium stearate is a toxic and unsafe product. Consumers are highlighting absorption issues related to magnesium stearates. However, there is no such evidence that shows stearates interfere with the intestinal absorption of nutrients. Although magnesium stearate is one of the commonly used incipient in the manufacture of pharmaceuticals, lack of awareness about the stearate among consumers is hampering its market growth. Thus, issues such as rise in raw material prices, environmental regulations, and lack of consumer awareness are likely to hamper growth of the stearates market. This, in turn, is expected to hamper growth of the industry for rubber processing chemicals such as anti-tack agents. 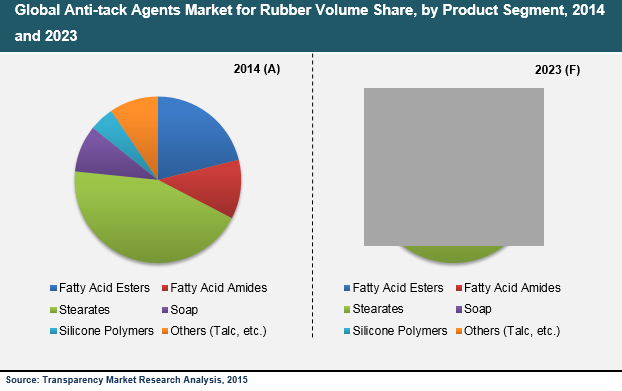 Demand for stearates was the largest in the anti-tack agents market for rubber in 2014. Stearates accounted for over 40% of the market share in 2014 and are commonly consumed as lubricants and stabilizers in the plastic & rubber processing industry. The plastic & rubber processing industry is one of the major end-users of stearates. In the rubber industry, stearates are considered to be an effective elastomer processing aid and releasing agent. Stearates are often used as vulcanization aid and anti-tacking agent in rubber processing. Fatty acid esters was the second-largest product segment in 2014. Fatty acid esters are used to impart anti-adhesive property to the rubber substrate. Products such as monoglycerides are widely used in the anti-tack agents market for rubber. Other products such as glycerol monostearate (GMS) are also used in uncured rubber and are slowly replacing talc in the anti-tack agents market for rubber. In 2014, Asia Pacific accounted for over 50% of the market and exhibited the highest regional demand in the anti-tack agents market for rubber. The region, particularly ASEAN, is largely responsible for substantial production of rubber. This, in turn, has generated high demand for rubber processing chemicals such as anti-tack agents. Countries such as Thailand, Indonesia, and Malaysia are some of the largest consumers of anti-tack agents due to large-scale production of rubber. Leading companies such as Baerlocher GmbH, Croda International plc, FACI S.p.A., Struktol GmbH, H.L. Blachford Ltd., Evonik Industries AG, Lion Specialty Chemicals Co., Ltd., The HallStar Company, and King Industries, Inc. have been covered in the report. This report provides detailed analysis and forecast of the anti-tack agents market for rubber on a global and regional level from 2015 to 2023. On the global level, the market has been segmented based on volume (tons) and revenue (US$ Thousand) during the forecast period. For an in-depth understanding of the market at the regional level, demand for anti-tack agents materials has been forecast in terms of volume (tons) and revenue (US$ Thousand) from 2015 to 2023. The report includes drivers and restraints and their impact on the market growth during the forecast period. Furthermore, the study encompasses various opportunities for market growth at the global and regional level. We have included a thorough analysis of the value chain to provide a detailed understanding of the market. Additionally, the report covers Porter’s Five Forces Model analysis, which provides an insight into the intensity of existing competition in the market. The study also comprises market attractiveness analysis wherein numerous end-users are benchmarked based on their market size, growth rate, and general attractiveness. We conducted in-depth interviews and discussions with numerous key industry participants and opinion leaders for the purpose of this research report. Primary research represents the bulk of our research effort coupled with extensive secondary research. We reviewed key players’ annual reports, product portfolio, press releases, and relevant documents for providing competitive analysis and better market understanding. Secondary research includes in-depth research on current trends, technical writing, recent trades, Internet sources, trade associations, and statistical data from government websites and associated, authorized agency websites. This proved to be the most successful, effective, and reliable approach for obtaining concise data, capturing industry participants’ insights, and recognizing opportunities and growth. Inflation is not a part of pricing in this report. This report provides size of the anti-tack agents market in 2014 and forecast for the next eight years. The global market size of anti-tack agents is presented in terms of volume and revenue. The market volume and revenue have been estimated and forecast in tons and US$ Thousand, respectively. Market numbers are estimated on the basis of various key products and applications of anti-tack agents. The market size and forecast of each segment are provided in the context of global and regional markets. The market has been segmented based on various products. Each segment has been analyzed and forecast based on volume (tons) and revenue (US$ Thousand) from 2015 to 2023. Additionally, segments have been analyzed and forecast based on current trends at the global and regional level. Geographically, the market has been segmented into North America, Europe, Asia Pacific, Latin America, and the Middle East & Africa (MEA). Demand has been analyzed and forecast based on current trends for a period of eight years. The report provides profiles of leading companies such as Baerlocher GmbH, Croda International plc, FACI S.p.A., Struktol GmbH, H.L. Blachford Ltd., Evonik Industries AG, Lion Specialty Chemicals Co., Ltd., The HallStar Company, and King Industries, Inc.